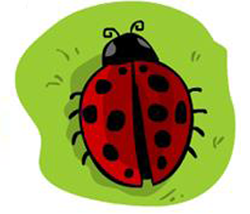 A ladybug is perhaps one of the easiest insects to draw, and it is also cool because of its lovely polka-dot colours. Let's try it now. 1. 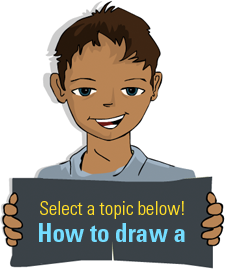 Start by drawing a circle and a little arch on the top for the head. 2. Divide the back into two and open up the wing a bit. If you like, you can just leave it like that, and it will also be good. 4. Throw in some colour now... red! You can also get creative and introduce your own colours. 5. Introduce a background colour and give it a shadow for it to take form. The top of the ladybug is a dome shape so you can give the edge of a lighter red. 6. Add some black dots to the back and throw in some texture on the grass and there you go... a lovely ladybug!